The Emma Twister Counter is a collapsible display counter available in a 3 foot tall counter format. Its anodized aluminum frame makes it an elegant display solution. The Emma is ideal for showcasing your products in retail locations or during events. The Isabella Twister Counter is a collapsible display case available as an illuminated 6.5 foot tall format. The Isabella is ideal for showcasing your products in retail locations or during events. Convenient and powerful! The Blizzard Counter is the practical starting point for all marketing activities. The printed fabric wraps around the frame, and at the back there is access to two shelves which are ideal for storing brochures and personal items. Combine with your choice of any of our displays for a full showcase solution. HingeCounter is one of the best sampling counters on the market. Its hinge construction makes it sturdy and incredibly quick and easy to set up. This means that you can keep heavy products on the counter and not have to worry. It also gives you the option of adding inside shelving for additional storage. Add a reception top or a thru-shelf to create a custom look. PopUpCounter is the perfect balance between elegant design and simplistic functionality. This display is great for sampling and demonstrating products and is ideal for the trade show environment, and it comes with inside shelves. It assembles quickly and easily and packs away into a neat carrying case. Attractive and impactful, DemoStand 2 makes any demonstration look professional. DemoStand 2 is a portable demonstration tool as well as a sampling stand or information booth. Customize the curved base and roomy header with your graphics or logo. Easy-clean, high impact polystyrene top has resilient molding on the edges for protection. Its worktop is as durable as its inner shelves which allow for plenty of storage space for supplies or product. And when the show is over, it folds flat and travels light and hassle-free in its own nylon bag. Go ahead – show and tell. The Emmett oval pop-up counter has a quick setup with easy snap on mechanisms. Its’ frame is a lightweight, durable aluminum with a high quality dye sublimation printed fabric graphic. Dimensions are 30”W x 37”H and 15.5”D. Make your message come full circle with Round-Up. Use it as a column. A podium. A demo station. Make it tall or stout. It's strong enough to work as a POP base. The graphic attaches to the robust round support pieces by magnet. Made of only three components so it packs flat and compact. It's as easy to assemble as it is to change visuals. So you're always the centre of attention. Optional illuminated attachment makes the RoundUp stand out even more. With its magnetic locking system, the FabriCounter is easy to set up and is compact. Fabric graphic panel is attached using Velcro, making graphic changes quick and easy. This unit is great for travelling displays as it is super lightweight and packs away into a small carrying bag. 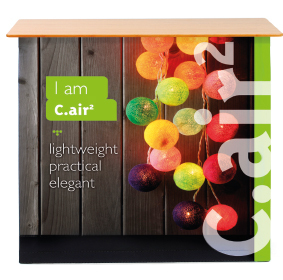 c.air² is a convenient and elegant counter solution. It unfolds like a pop-up booth and features a dye-sublimation printed fabric graphic for exceptional color execution. The graphic stays attached to the structure to allow for immediate use, thus making set-up and dismantling quick, easy and intuitive. Lightweight and compact, you can easily transport c.air² in its customized bag. The Cooler CounterCase is a portable/hard plastic shipping and storage case in one. It is the perfect solution for sampling and demo programs. The top shelf acts as an ice tray for cold beverage sampling. The wheels and handle allow for easy transportation.